How can we be sure those predictions of 90-degree August days aren’t just alarmism? For months now, scientists have been predicting a warming trend in the northern hemisphere. The exact reasons are a little technical — something to do with the tilt of the Earth’s axis as it makes its annual trip around the Sun — but the overwhelming majority of scientific experts have formed a consensus around a theory called “season change”. Supposedly, we were in “winter” back in January and February, but some time in the last couple weeks we passed into “spring”, which the theory says will lead into “summer”, a bizarre time when the snow will vanish completely, trees will sprout green leaves so dense that they will form shade-casting canopies over some small-town streets, and ultimately temperatures will be hot enough to fry eggs on the sidewalk (a practice that is not recommended). I grant you that this all sounds a bit unlikely in light of our recent weather experiences here in New England, and the idea that we have crossed into a new “season” of growth and going outside without coats sounds a little New-Agey, a bit too similar to the dawning of the Age of Aquarius. After all, we supposedly crossed into spring on Thursday, but I didn’t feel any change, and when I got up Saturday morning (in Bedford, Massachusetts) there was new snow on the ground. All the same, though, I’m told that the science here is pretty solid. And if the eggheads’ predictions are true, then there’s no time to waste. We are already experiencing the early effects of season change, and if we’re going to be ready for the greater changes to come, we need to start taking action now: planting gardens, checking air conditioners, finding our baseball equipment, getting the lawn mower out of storage, reserving that cottage in Maine, and stocking up on the shorts, sandals, and sunblock that we will all need if we are going to survive the coming hot times. But, of course, pointing to a warm day just allows him to point to a cold day, like the snow I already mentioned on Friday night. One day’s weather, I’m forced to admit, does not make a season. And while I can find graphs of January through March that show a clear temperature uptrend, he can respond with his own graphs, like this one from timeanddate.com, that starts on that warm March 15. I suppose I could reject his graph by throwing back at him his previous claim that data like this ultimately comes from weather services, which he doesn’t believe because they are all staffed by season-change believers. (That’s true, it turns out. If you call any weather service in the country, the person you talk to will endorse season-change theory without even mentioning arguments against it.) But conversations like that have not gone well in the past. They tend to spiral off into claims and counter-claims that make me lose track of how we got onto this subject. Pointing to buds on trees only leads him to claim that he saw similar buds during that warm spell in January. I don’t remember them, but he does, so that discussion also goes nowhere. There’s one argument, though, that Jim has never really had a good answer for: the days are getting longer and the nights shorter. The warmth of the sun is something we can all feel, so it seems intuitively clear that all the extra sunlight is eventually going to lead to warmer weather — and perhaps, by July and August, to oppressively hot weather, hard as that is to imagine. And unlike temperature, the length of the days doesn’t fluctuate: Every one is a little bit longer than the one before, and will be until the summer solstice in June. In the past he has dodged and distracted when I bring up the lengths of days, so maybe if I compile a list of sunrise and sunset times going back to the winter solstice and projected ahead to the summer solstice, that will finally get through to him. I should probably try that. But I’m not sure I’m going to have time today; I need to go out and buy a pair of shorts. Afterward. Obviously, I’m making an analogy to climate change, and the kinds of arguments you will hear from people who deny the science around that. The explanation of why climate change is happening is a little more complicated than the explanation of season change — the position of the Earth’s axis relative to its orbit around the Sun produces longer days in the northern hemisphere, and all that extra solar energy eventually warms the atmosphere — but not that much more complicated: Burning fossil fuels produces carbon dioxide, which collects in the atmosphere and acts as a greenhouse gas, preventing some of the Earth’s heat from escaping into space; the more carbon dioxide, the less escaping heat, and hence a warmer planet. The analogy to the days getting longer is the rising concentration of CO2 in the atmosphere. (Temperature will, of course, fluctuate during the year according to time and place, and even year-to-year statistical measures like the average global temperature don’t increase in lockstep, with each year warmer than the last. That’s why you will see those claims that global warming ended in 1998 or 2005 or some other hot year. My season-denialist’s claim that seasonal warming peaked on March 15 is an exact analogy to that argument.) But other than an annual cycle caused by northern-hemisphere forests binding CO2 into their leaves, the amount of CO2 in the atmosphere does indeed go up every year. Even if this year turns out to be cooler than last year, atmospheric CO2 is still increasing. Living in New England, I experience a number of chilly March and April days when I think, “Is spring really going to happen this year?” But I look at the sunrises and sunsets, and that fear goes away. Similarly, but with the dread pointed in the other direction, I also sometimes look at temperature graphs and wonder if maybe global warming has leveled off without us having to make any sacrifices. 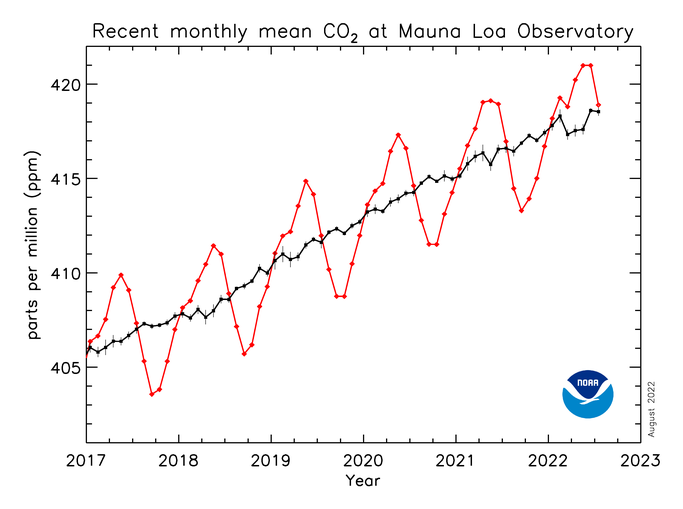 But then I look at the CO2 graphs and know that these hopes are just wishful thinking. As long as atmospheric CO2 keeps rising — and it has shown no signs of stopping for a long, long time — hotter years are coming just as surely as August will be warmer than March. I’ve come across other arguments from climate change deniers. 1. Conspiracy theory. “Climategate” proved that all climate scientists are either liars or mindless dupes. The only scientists we can trust are the ones funded by the fossil fuel industry; the academic and government ones are all bought and paid for. If the weather service can’t give me an accurate forecast for next week, why would I believe them when they say August will be hotter than January?